Forward part of the board; it curves slightly upward. Usually retractable, vertical skeg that keeps the board on course. Part of the sail that slips over the mast; it has an opening for the wishbone boom, where it is attached to the mast. Front edge of the sail; it is located along the mast sleeve. Transparent section through which the windsurfer can see any objects or boats on the other side of the sail. Metal or carbon hoop that is attached to the mast at one end and the clew at the other; it directs the sail and helps the windsurfer stay balanced. 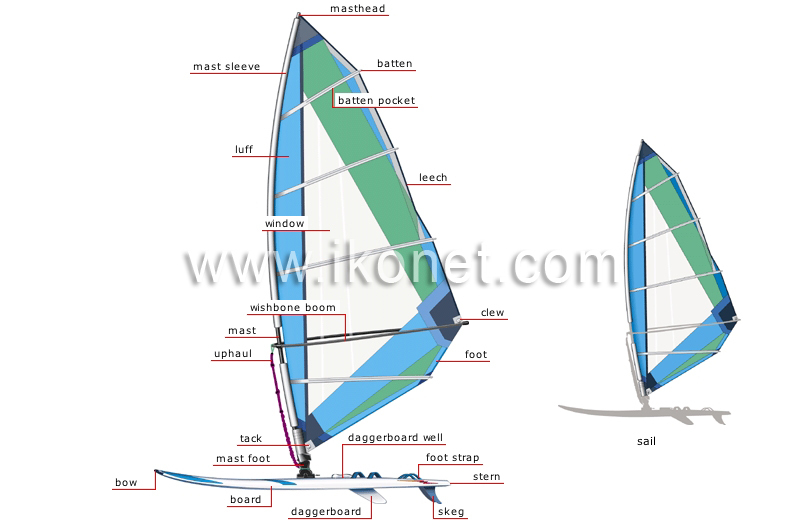 Long vertical part that is sometimes slightly inclined; it supports the wishbone boom and the sail. Knotted rope that runs from the wishbone boom to the mast foot; it is used for righting the sail when it is in the water. Point that forms the front lower angle of the sail; it is attached to the foot of the mast sleeve. Articulated part that connects the mast to the board; it allows the mast and sail to pivot. Floating device made of synthetic material on which the windsurfer rides; its shape varies depending on its use (racing, slalom, waves, jumping). One of the triangular parts aft and under the board that stabilize its course; the shorter the skegs, the easier the board is to handle. Back part of the board. Belt attached to the board to hold the windsurfer’s foot in place; this provides maximum control of the board, especially against strong winds and waves. Slot running through the board into which the daggerboard slides. Lower part of the sail between the clew and the tack. Point forming the small angle at the back of the sail; it is attached to the wishbone boom. Aft edge of the sail between the masthead and the clew. Top end of the mast. Assembly of fabric or plastic sections that is rigged on a mast; it forms a surface that allows the board to sail with the wind.